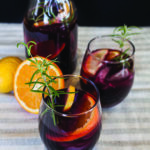 The combination of citrus and rosemary with a light bodied red wine creates an easy-to-drink cocktail suitable for any occasion. You can’t go wrong with a Merlot or Syrah but heavier bodied wines can work here as well, especially as the months become cooler. The combination of citrus and rosemary with a light bodied red wine creates an easy-to-drink cocktail suitable for any occasion. Combine orange slices from one orange, lemon slices and sugar to a large pitcher; gently muddle until sugar is dissolved and fruit releases some juice but is not completely crushed. Add orange juice, Triple Sec, and wine. Stir to combine and refrigerate for at least 2 hours or up to 8 hours. To serve, stir briskly to redistribute settled fruit and pulp; serve over ice and garnish with orange slices and rosemary sprigs. This is one of four recipes in a picnic series that were recently featured in the Spring issue of Revival Magazine. Check out my Apricot-Almond Galette or Turkey and Fig Panini from the same story.